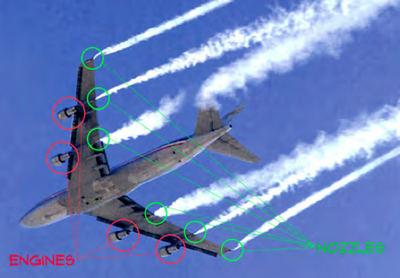 What Are Chemtrails All About, and Who is Responsible? The Rockefeller family controls a significant portion of the pharmaceutical industry. David Rockefeller is one fo the primary monsters responsible for drafting plans for "secret" (by their own admission) population reduction. Population reduction is being implemented by the U.N. (U.N. Agenda 21) through vaccination additives and chemtrail spraying. Should we be surprised to find the Rockefeller family as founding members of the U.N.? Remember, chemtrails are a population reduction methodology, and since spraying began, most countries of the world are (now) below-unity in population growth (experiencing population reduction), but you won't hear about this on the news. Chemtrails cause most people to become sick before they die (cancer, heart disease, chronic fatigue, depression, etc). The pharmaceutical industry profits greatly from sick people. I know this is a little complicated, but are we beginning to see the connection? In short: Create a problem (population); Invent a solution that profits you (U.N. endorsed chemtrails). This type of criminal mindset is called machiavellianism.